BAIN install packages for popular UI mods originally bundled as Fomods for OBMM. Wrye Bash, still being maintained and supported for Oblivion is now the first choice for players of Oblivion. Wrye Bash Wrye Bash Mod Manager is required, and all these mods use its wizard functionality. Resolved overlapping in BTmod Faction status display. 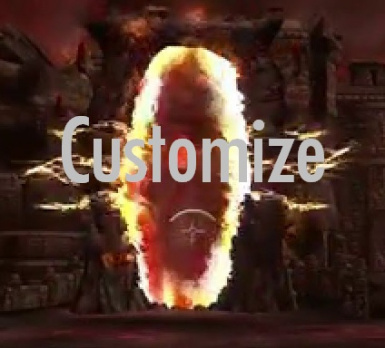 see http://www.theassimilationlab.com/forums/topic/16564-btmod-customization/? You know, when playing Oblivion in the days of OBMM, OBMM was fun, until Wrye came along and Bashed on its parade. But you couldn't install DarN or DarkUI'd DarN without OBMM, unless deciding to go the manual way, when, if Wrye Bash was running, could develop into an issue or three. And Wrye's response, the DarN BCF didn't turn out to be everyone's cuppa. This mod gives the Oblivion UI the most extensive facelift yet. It's goal is to rid the pc version of the horrid xbox interface. Fonts are smaller, settings can be adjusted in game, user controls are scaled, more info on screen, and the hud is vastly improved. I've changed the colors of certain things in certain places that differ from the normal DarkUI, simply because the changes of DarNified UI called for this. For instance, when choosing a dialog option, the person's name is now whiter than the dialog choices, so as to make it easier to discern between the person's name and the options. I also worked out a lot of niggles and bugs, such as when you are over encumbered, now in the inventory, like in the container, only the current encumbrance is red, not the max and the current and the slash. A package with several additions to both DarNifiedUI and DarkUI\'d DarN. Including more stuff for your Map Menu, crosshair, sneak icon and more. Quest Log Manager adds a button to the right of each current quest in the log, and clicking on the button hides the quest. So click on all the quests you're not interested in, and you'll get a much cleaner quest log. By default, the buttons are always visible for current quests, but by setting the hide_key setting in "Ini\Quest Log Manager.ini" to the value of a modifier key (like left shift), the buttons will only be visible when this key is pressed. Quest Log Manager adds a button at the upper right corner of the "Current Quests" log, named "Show hidden". If you click on this, instead of viewing the current quests, you now get to see all the hidden quests, and you can click on their buttons to move them back to the current quests. If a hidden quest becomes active, it will automatically be moved back to current quests. Note: In the porting of the mods, every attempt has been made to preserve original components, along with their corresponding author descriptions. Oblivion, and Wrye Bash Mod Manager. Move/Copy one of the downloaded files to the Bash Installers Folder, or drag it into Wrye Bash's installers Tab. Right click on the package in the Installers Tab, click Wizard, and follow the prompts. Please check that the Ini Tweaks have been applied in the Wrye Bash Ini Edits Tab before launching the game. And check them again after uninstalling any of these mods! Enjoy. Wrye Bash team, especially Utumno, DarN for DarNiFied UI, Gothic251 for DarkUI'd DarN, Kyoma for DarNified Additions, and Beermotor from Mertz's WizBAIN thread. Resolved overlapping in BTmod Faction status display. DarN, DarkUI'd BTMod Packages: Wrong files removed.